Ugly messy concept sketch for my next piece. I got my inspiration from looking at Paul Kidby's depiction of Lu Tze. I thought to myself, "groovy... cool... but wouldn't it be better with monkeys?" Obviously, there is still a lot of work to do before I can get down to the details. The arms need to be adjusted and the legs tweaked along with the hands and feet. Oh, and he needs a tail. I'm also thinking that I might try to do this one in color. Perhaps watercolor or acrylics if I can build myself a decent light table between now and then. 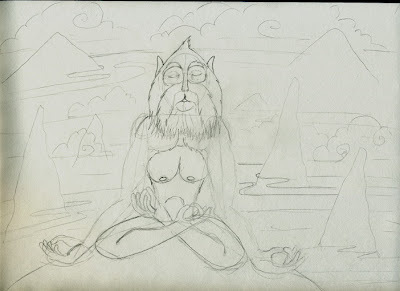 (btw, the inspiration monkey is a balinese macaque in case you were wondering).